Published August 21, 2013 By Anna T. This post may contain affiliate links. Regardless, I only recommend sites I've researched and/or used and trust. If you are a nurse looking to make money from home, you might consider getting involved in telephone triage. There are companies nationwide that are continually on the lookout for qualified nurses to fill these positions. As a nurse doing telephone triage from home, you will take calls from patients, assess their various symptoms, and then help to point them in the right direction regarding medical care. Pay for this is competitive with some nurses making around $30 an hour, give or take, although I've read it can be a stressful job — particularly during cold and flu season. Pay, requirements, benefits, etc. will vary depending on who you work for. Keep in mind that telephone triage from home often means working long shifts with nights and weekends most likely required. And just like with any phone job from home, background noise would need to be eliminated. Below are some companies that regularly hire nurses to work from home doing telephone triage. Note that not all of these companies are hiring now. Still, it's smart to keep tabs on them if this line of work interests you. I also recommend checking with doctors and hospitals in your local area just to see if they have any similar openings for nurses to work at home. Hires work from home registered nurses to work as “care advisors” doing telephone triage as well as other services (medical device monitoring, health care support, etc.) from home. Only open to people in AR, IA, MS, MO, ND, NE, NC, SC, TN, TX, and VA. They offer full-time only with a commitment to one weekend shift. The job listing says that your compensation is based on your location and your years of experience. However, I checked Glassdoor, and most RN's with this job claim to be earning $25 to $26 hourly. Carenet requires 3+ years experience in the following areas: Emergency Nursing, Pediatrics, Home Health Care, ICU, Med/Surg. and/or related fields dealing with patients of all ages. You must also have an Unrestricted current RN license with the ability to become licensed in additional states as required. Go here to check for openings at Carenet. Nurses for Fonemed provide telephone triage and health advice to callers across North America. This position requires flexibility with your hours (you must work three weekend shifts per month), a quiet, dedicated workspace in your home with a land line phone and zero background noise. To qualify, you must have at least three years of recent clinical experience, pediatrics and adult (Emergency Department triaging is preferred). Fonemed also prefers to hire applicants with previous experience in telephone triage using electronic triage software and computerized medical protocols – preferably 1 or more years’ experience. While the job listing doesn't state what pay starts at, a quick check of Glassdoor shows most triage nurses working from home for Fonemed are earning at least $25 hourly, with some earning as much as $31 hourly. Go here to check for openings at Fonemed. Occasionally hiring experienced RN’s to do telephone triage from home. Search “telephone triage” in the keyword box to see if they have any work from home positions open. Pay is not posted, but they claim it is “competitive” and some searching on Indeed.com shows us that most nurses at Anthem are earning over $50K yearly. Go here to check for telephone triage openings at Anthem. Hires work from home call center RN's regularly. Note that these positions list a location but also say you can telecommute from anywhere in the US. According to Glassdoor, the call center RN's at United Health Care earn about $36 an hour on average. United Health Care frequently hires call center RN's to work full-time or part-time hours from home. Even if you choose to work part-time, you will be required to work full-time hours for your first 4-6 weeks during training. Go here to check for these openings at United Health Care. There isn't a ton of information on the website about the job, but this company does claim to be hiring RN's to work at home doing telephone triage. You must have at least five years of past nursing experience, preferably in pediatrics, as well as thorough knowledge and experience using Barton Schmitt, MD protocols. Full-time and part-time positions. Unfortunately, I was not able to find salary information for this company. Go here to check for openings at NurseTriage.org. 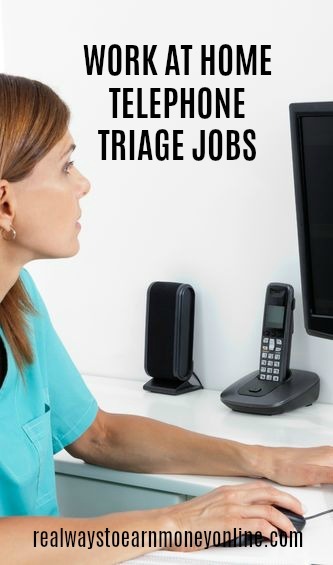 While I was digging around for information on telephone triage from home, I came across a sort of interesting discussion online among nurses who are/were doing triage from home. They are mostly very candid about pay, how the job works, etc. You can read that here. If you've ever done telephone triage from home or would like to provide some extra information, please feel free to comment below and share. Looking For More Telephone Triage Jobs? If so, FlexJobs is a very good resource. They specialize in listing flexible and work at home jobs, scam-free, and ad-free. While they do charge a small fee to access their listings (currently $14.95 a month), I have found it to be worthwhile and I do pay for it myself. There are many, many medical jobs listed on the site at any given time if you do a search. You can go to their “medical” category and then select the option in the dropdown for “100% telecommuting) to see what is available once you're signed up. If you do sign up, don't forget to use promo code AFFILPROMO to get 30 percent off the price you pay for your subscription.